Carrabba's is one of our favorite chain Italian restaurants. We don't go very often, but when we do, we both really enjoy it. One of our favorite dishes is Pasta Carrabba - fettuccine alfredo with grilled chicken, sautéed mushrooms and peas. Chicken Legs loves everything about this dish. 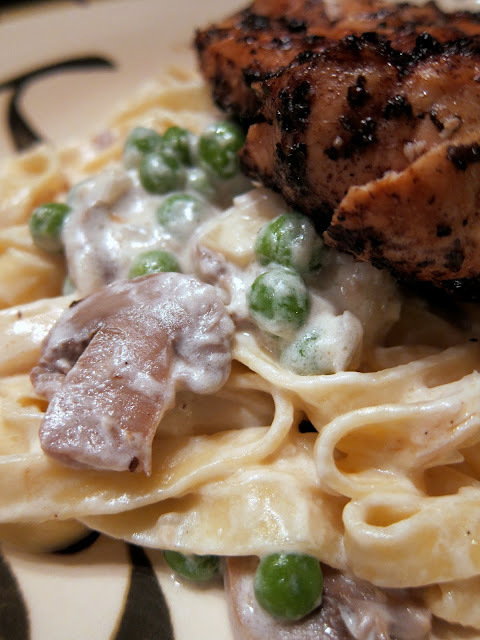 I hate the peas and mushrooms, but love the chicken and sauce (I'm like that). The chicken was extremely impressive - it is good enough to stand on its own. I was worried that it would taste too vinegary, but it didn't. It was great. Give this a try - I promise you won't be disappointed! Combine vinegar, oil and basil. Pour over chicken and marinate overnight (I use a ziplock bag) in the refrigerator. Grill the breasts or bake in a 350ºF oven for 30 minutes. Set aside. Peel and finely chop shallot. Saute in butter 1 minute. Add garlic and saute until fragrant. Add cream, salt and pepper to taste. Boil to reduce slightly to the consistency of a light sauce, just thick enough to coat a spoon. Add mushrooms, peas, and parmesan cheese and cook another 2 minutes. Cook pasta, drain and shake out excess water. Thinly slice chicken. Add to pasta and gently toss with sauce, along with cheese. Serve immediately. You're killing me with these grilled chicken and cream sauced dishes - looks like another meal ala Steph coming soon. This is exactly the sort of recipe my hubby will love, too. It looke delicious - thanks for sharing! Great looking chicken. Luv the way it looks! Sounds fantastic, although I wouldn't want anything to do with the mushrooms either. Heh. We don't have a Carrabba's anywhere around here, but that's some rockin' chicken there!! How do you eat this if you don't like the peas and mushrooms? LOL, you pick 'em out? The only thing I've eaten at Carrabba's was the shrimp and it was overcooked. This looks amazing.....I'd have to leave out the peas though. Thanks so much for posting this recipe, it's what my wife wanted for Mother's Day and she was wowed by it. A quick suggestion however (I found it to be a little on the bland side) is to add 1 cup of white wine before adding the cream and reducing by half, it really really brings out all the flavors. I worked at Carrabba's for a number of years and the dish is a bit more involved than this recipe. P.S. never ever ever ever everrrrrrrrrr use canned mushrooms. They are sauteed and stand on their own as well. One of my all time favorite recipes! Thank you so much for sharing this! This was very good! I marinated my chicken for almost 48hrs as I was too tired to cook after work the first day, but made it tonight (with scallions in a bit of garlic to sub shallots) & it was great! Made this for dinner tonight. Awesome! Loved the flavour of the chicken. Added an extra 1/4 cup parmesan cheese to the pasta. It was so cheesy! Didn't add mushrooms as we don't like them. Would definitely make this again. Thanks for a great recipe. 10/10!